The 6 days Tanzania wildlife safari or 6 days Lake Manyara, Serengeti, Ngorongoro & Tarangire wildlife tour in Tanzania is a wholly wildlife safari in Tanzania. The tour takes you through Tanzania’s famous destinations of Lake Manyara National Park, Serengeti National Park, Ngorongoro crater and Tarangire National Park. Featuring a great deal of wildlife including the African Big five of land animals, culture and heritage at Olduvai Gorge and scenery in Ngorongoro Crater this exclusive trip starts and ends in Arusha. 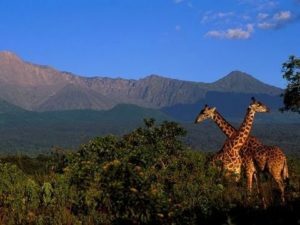 Your professional Tanzania wildlife tour guide will pick you up at the start of your safari from Arusha, and start the drive to Lake Manyara National park where you will do 2 game drives one in the evening and another in the morning the next day. You will later on in the evening drive to Serengeti national park where you will do a full day game drive and another game drive the next morning before you transfer to Ngorongoro crater for a tour then be driven back to Arusha the next day. On the fourth day of your safari, you can choose to camp at the Ngorongoro crater rim or spend the night in the nearby lodge. You then continue to Tarangire National park for a game drive before returning at the end of your trip to Arusha. Day 1: Your driver guide picks you up for a transfer from Arusha to Lake Manyara National Park where you do an evening game drive. Day 3: You will spend the day having a great encounter at the Serengeti National Park plains. Day 4: After breakfast, you are driven to Ngorongoro crater with a stop at Olduvai gorge which is the place known to be where early man’s skull was discovered. Day 5: In the morning, you have breakfast then drive out of Ngorongoro conservation area to Tarangire National Park where you have an evening game drive. Day 6: You have a morning game drive then after your driver guide transfers you back to Arusha. From an accommodation facility in Arusha (the world’s safari capital), a professional Tanzania safari driver guide will pick you up for a drive to Lake Manyara National Park. Lasting about 2-3 hours, you arrive for check in and a meal at a booked accommodation in Lake Manyara National Park. After then, you head into the Lake Manyara National Park located at the foot of the Great Rift Valley’s western escarpments for an afternoon game drive. Covered by a massif shallow soda lake, the park hosts a variety of wildlife including Africa’s largest concentration of elephants, tree climbing lions and the beautiful flamingos by the algae lake. You return to your preferred hotel/lodge for the night. After breakfast, the Tanzania tour continues with a drive towards the Serengeti National Park driving through the beautiful Karatu and the Ngorongoro Conservation Area. Cruising in a 4×4 safari land cruiser, you slowly descend to the wildlife filled heart of the wild Africa with vast plains greater than where your sight may end. On arrival, you have lunch then continue for an evening game drive to the central park area, known as the Seronera area, one of the richest wildlife habitats in the park, featuring the Seronera River, which provides a valuable water source to this area and therefore attracts wildlife well representative of most of the Serengeti’s species. You spend the night on a preferred accommodation in Serengeti national park especially within the Seronera area. After breakfast, you will again get into the Serengeti plains where you go for another game drive. On this day, you go to the Sogore River Circuit south of the Seronera River with possible sightings of the Lion, Thompson gazelle, topi, ostrich and the cheetah. After the game drive, a visit to the visitor Centre close to Serengeti Seronera Lodge will offer more knowledge on the wildlife and area of the park. You then have picnic lunch and continue with an afternoon game drive. More of tree climbing lions on an East African safari are encountered on a Uganda wildlife safari to Queen Elizabeth National Park. Uganda and Rwanda are the perfect destinations for gorilla trekking in Africa to add on an East African safari, it can either be a Uganda gorilla trekking safari to Bwindi impenetrable national park or Rwanda gorilla safari to Volcanoes National Park. A Prime Safaris we guarantee an Ultimate African Safari. We offer Tanzania Wildlife Safari tours, Kenya Safari tours, Uganda Safari Tours, Rwanda Gorilla Tours, Congo Gorilla Trekking Safaris. Book with us and you will enjoy your trip from day one.